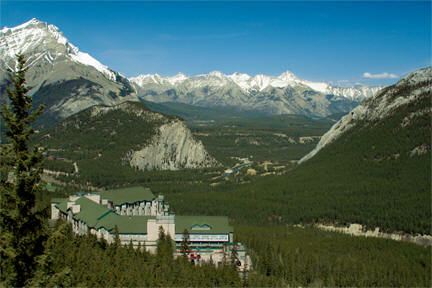 On August 13th 2009, a private tour will be held for all Banff Conference Delegates. This event is a perfect occasion for the entire family. The date and time of the tour is subject to change while the schedule is further finalized. Please RSVP your attendance as soon as possible by emailing vsheldon@ualberta.ca. 18:30 Tour departs. Commentary is provided throughout. Highlights include: Banff Springs Hotel, Bow falls, Lake Minnewanka, Bankhead viewpoint/lamp house. 21:30 Arrive at the Banff Gondola on Sulpher Mountain, and depart for the summit on the 8 min, high-speed gondola. Gondola view of the Rimrock Resort Hotel.